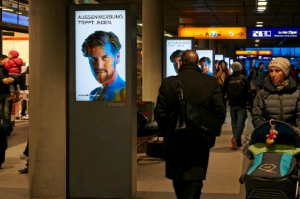 Here’s an interesting study we came across on Ooh-tv, highlighting the perception of Germans on digital out-of-home advertising. We thought you’d be curious to know their opinions on the topic so here they are. The study conducted by the German Association of Outdoor Advertising and media agency PosterSelect shows that 2/3 or 65.3% of the surveyed population acknowledges seeing ads on digital displays in public spaces. It also revealed that this perception varies with income. For example, 73% of those coming from households with incomes higher than €3,000 notice the communications on the displays while only 53.8% of those whose households have an income of €1,000 or less do so. This difference could probably be explained by the places they frequent. The study reveals that airports and train stations are the locations where digital screens are prevalently noticed (arguably because of their size, number and content which is most of the times very well- designed and well- targeted). – purchase recommendations (34%)- probably a more obvious type of advertising. 56% of the Germans consider the adverts shown on digital displays informative and 39% of them perceive them as innovative and appealing. This study reinforces the impact of digital signs in transient environments (as public spaces are). No matter the footfall, the people will notice them if they are visible, show good quality, relevant content and even more if they’ve got some spare time on their hands (when waiting for a flight or train, for example). You can read the entire study (in German) here. Feel free to download one of our sector- specific white papers to learn more about digital signage.